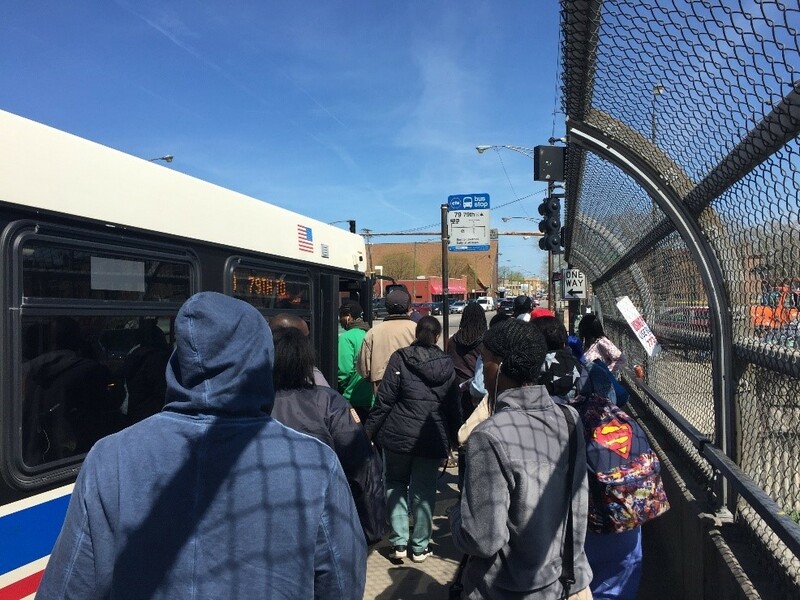 Getting to jobs on time is difficult for many West Side residents who rely on the bus during off-peak hours. Active Trans joined Charles Perry, Director of Organizing at the West Side Health Authority, in testifying before the CTA board in January. We were calling for the transit agency to develop a plan for 50 miles of transit priority streets for Chicago. As one of our Bus Advocacy Community Partners, the West Side Health Authority used mini-grant funds from Active Trans to collect 70 surveys from Austin residents about the quality of local bus service. We shared their stories and copies of the Bus Friendly Streets Report Cards with the CTA Board, highlighting that the 37th Ward received a D and the Chicago Avenue route received an F, which is where Perry did most of his surveying. Perry spoke with many laborers who work the early shift and must leave home near Chicago Avenue on the West Side at 4:30 a.m. to get to their jobs in the Western Suburbs or North Side. For some they must take an Uber to a designated spot in order to catch a bus that could help them get to work on time. Others say it is much simpler to take an Uber and pay a few extra dollars because it is more convenient. Without more investment in our bus system, fewer people will continue ride the bus on the West Side. Another major issue is the lack of bus shelters along Chicago Avenue. The residents talked about how they see bus shelters in other communities along major routes, but very few in their community. When the weather is bad and there is a bus shelter available, it’s often unusable because of snow and ice. Better maintenance clearly is needed. The CTA Board is the governing arm of the CTA. The board consists of seven members — four appointed by the mayor of Chicago and three appointed by the governor of Illinois. Their monthly meetings, held at CTA headquarters at 567 W. Lake Street, are open to the public. You can sign up to testify and give public comment here. Want to engage your alderman in person? Check out Chicago’s first-ever Bus Friendly Streets Report Cards and sign up as a Back on the Bus Volunteer to learn about how to advocate locally within your ward for bus only lanes, faster boarding, and giving buses priority at traffic lights.